July is the quietest month on Severnside with only 153 species having been recorded. It does have a more optimistic feeling to it than June, with the appearance of returning waders and in recent years the regular appearance of Mediterranean Gulls. Unusual species seen have included Cattle Egret (2017), Temminck’s Stint (2017), dispersing Crossbill, Lesser Spotted Woodpecker, Goshawk and a Stone Curlew (1999). A spell of strong SW or W wind usually produces a few Storm Petrels and Manx Shearwaters. A warm day following a night with torrential rain. A morning visit to the New Passage/Northwick Warth area produced 90+ Black-tailed Godwits, 120 Redshank, 300+ Dunlin, 5 Common Sandpipers, 11 Turnstones, 8 Ringed Plover, 50+ Curlew, a Little Egret, 95 Canada Geese, 3 Shoveler, single Wigeon, Raven and singing Willow Warbler. Another 3 Little Egrets were seen at Severn Beach. A breezy day with showers. A juvenile Mediterranean Gull, 86 Black-tailed Godwits, 3 Common Sandpipers, 150 Dunlin, 6 Ringed Plover, 3 Little Egrets, single Wigeon and Raven were seen in the Northwick Warth area. A wet and very windy day. The only reports from New Passage involved 3 Shoveler and a Grey Seal. A break in the weather with a cloudy, cooler day with strong South West wind and occasional squally rain showers. At least 120 Manx Shearwaters were seen off Severn Beach on the morning high tide where other sightings today involved 2 juvenile Mediterranean Gulls, 2 Common Terns, 7 Ringed Plover, 20 Dunlin and a Peregrine. A morning visit to the New Passage/Northwick Warth area produced 6 Little Egrets, 400+ Dunlin, 50+ Black-tailed Godwits, 140+ Redshank, 2 Turnstone, 2 Common Sandpiper, a Snipe and 40 Canada Geese. Another hot and humid day. A record 18 Little Egrets were seen today with roosting flocks of 13 on Pilning Wetland and another 5 at Severn Beach. Other sightings from Northwick Warth/Pilning Wetland included the first Green Sandpiper of the year, 7 Common Sandpipers, 2 Little Ringed Plover, 3 Whimbrel, 450 Dunlin, 60+ Black-tailed Godwits, 40 Curlew, 175 Redshank, 2 Snipe, 5 Turnstones, 60 Lapwing, a Ringed Plover, 3 Grey Heron, 38 Canada Geese and a Raven. 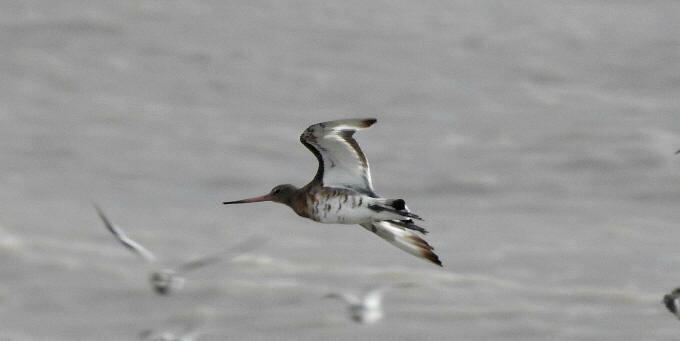 At least 90 Curlew, 16 Dunlin and 4 Ringed Plover were also seen at Severn Beach. The heatwave continues. Combined reports from the Northwick Warth/Pilning Wetland area included 2 Little Ringed Plover (adult & juvenile), 57 Black-tailed Godwit, a Whimbrel, 185 Dunlin, 3 Turnstones, 5 Common Sandpipers, 128 Redshank, 70+ Lapwing, 22 Oystercatchers, 4 Little Egrets, 35 Canada Geese, 27 Shelduck, 3 Ravens and 2 Kestrels. A Ruff, 60+ Black-tailed Godwits, 120+ Redshank, 80 Lapwing, 250 Dunlin, 3 Common Sandpipers, a juvenile Little Ringed Plover, a Little Egret, 36 Canada Geese and 3 Ravens were seen again this morning on Northwick Warth/Pilning Wetland. No change in the weather or the birds. A Ruff, a Little Ringed Plover, 2 Common Sandpipers, 100+ Redshank, 43 Black-tailed Godwit, 300 Dunlin, 90 Lapwing, 31 Canada Geese, 11 Little Grebes (including 3 fresh grebelets), 3 Little Egrets, 3 Ravens, single Sparrowhawk, Kestrel and Kingfisher were seen in the New Passage/Pilning Wetland area this morning. Another warm day without rain. A visit to New Passage this morning on the falling tide produced a Ruff, 45 Black-tailed Godwits, 120+ Redshank, 300+ Dunlin, 90+ Lapwing, 2 Common Sandpipers, a Turnstone, 27 Shelduck and 31 Canada Geese. Nearby, a Snipe, 4 Little Grebes, a Kestrel and a hunting Hobby were seen on Pilning Wetland. A juvenile Little Ringed Plover, 63 Black-tailed Godwits, 140 Redshank, a Sanderling, 315 Dunlin, 106 Lapwing, 2 Turnstones, 4 Common Sandpipers, 3 Little Egrets and 2 Whinchats were seen in the Northwick Warth area. Another 6 Little Egrets and 9 Ringed Plover were seen at Severn Beach. Combined reports from New Passage/Northwick Warth this evening involved a juvenile Mediterranean Gull, 60 Black-tailed Godwits, 3+ Common Sandpipers, 3 Turnstones, 300 Dunlin, 3 Whimbrel, 130 Redshank, 80 Lapwing, a Little Egret, 16 Canada Geese and a Teal. A warm and humid day with some light rain showers in the evening. A juvenile Little Ringed Plover, 4+ Common Sandpipers, 40+ Black-tailed Godwits, 290+ Dunlin, 90 Redshank, 70 Lapwing, a Little Egret, 22 Canada Geese, 3 Ravens and a Yellow Wagtail were seen in the Northwick Warth/Pilning Wetland area this morning. The warm dry spell continues. Sightings from the Northwick Warth area included 34 Black-tailed Godwits, 220 Dunlin, a Whimbrel, 3 Common Sandpipers, 30 Curlew, 60 Lapwing, 3 Little Egrets, 3 Grey Heron, 11 Canada Geese and 2 Shoveler. Another 8 Little Egrets, 5 Grey Heron, 10 Redshank, 10 Dunlin, 70 Curlew, 35 Oystercatchers and a Sparrowhawk were seen from Severn Beach. A Great White Egret was seen flying North over Pilning Wetland mid morning where other reports from here and New Passage/Northwick Warth involved the Wood Sandpiper, 76 Black-tailed Godwits, an adult Little Ringed Plover, 8 Common Sandpipers, 241 Dunlin, 60+ Redshank, 70 Lapwing, single Whimbrel, Little Egret and Common Tern, 3 Mediterranean Gulls (adult & 2 juveniles) single Yellow Wagtail, Raven, Sparrowhawk and Kestrel. Another 6 Little Egrets, 40 Curlew, 2 Redshank and a Whimbrel were seen from Severn Beach. The Wood Sandpiper, 7 Common Sandpiper, single Whimbrel and adult Mediterranean Gull, 43 Black-tailed Godwits, 86 Redshank, 130 Dunlin, 7 Little Egrets, single Raven and Yellow Wagtail were seen on Northwick Warth/Pilning Wetland today. 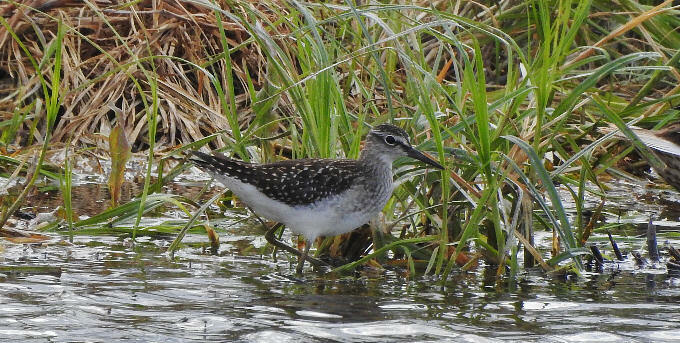 Click on the image below for a short Youtube video of the Wood Sandpiper. Combined reports from Pilning Wetland/Northwick Warth included a Wood Sandpiper, 34 Black-tailed Godwits, a Little Ringed Plover, 65 Redshank, 80 Dunlin, 3 Common Sandpipers, 140 Curlew, 70 Lapwing, a Whimbrel, 3 Little Egrets, 6 Grey Herons, an adult Mediterranean Gull, 650 Black-headed Gulls, 30 Shelduck, a Teal, 2 Red Kite, a Sparrowhawk, a Yellow Wagtail and 4 Ravens. Combined morning and evening sightings from the Northwick Warth/Pilning Wetland area involved a Wood Sandpiper, 24 Black-tailed Godwit, a Ruff, 9 Common Sandpipers, 40 Redshank, 45 Dunlin, a Whimbrel, 125 Curlew, a Little Egret, 2 Mediterranean Gulls (adult & 2nd summer), a Common Gull, 3 Ravens and a Yellow Wagtail. Three Whimbrel and 8 Little Egrets were seen at Severn Beach. Another fine sunny day. Combined reports from Northwick Warth/Pilning Wetland included an adult Mediterranean Gull, 500+ Black-headed Gulls, a Ruff, 35 Black-tailed Godwits, 7 Common Sandpipers, 45 Dunlin, 155 Curlew, 80 Lapwing, 40 Redshank, a Little Egret, 50 Shelduck, 7 Tufted Duck and 4 Ravens. Another 150 Black-headed Gulls, 2 juvenile Mediterranean Gulls, 12 Little Egrets, a Whimbrel, 3 Curlew, a Common Sandpiper, 22 Dunlin and 2 Ringed Plover were seen at Severn Beach. A sunny and humid day. An adult Mediterranean Gull, 300+ Black-headed Gulls, a Ruff, 12 Black-tailed Godwits, 28 Dunlin, 70 Redshank, 9 Curlew, 50 Lapwing, 20 Oystercatchers, 2 Little Egrets, 2 Ravens, single Sparrowhawk and Kestrel were seen in the Northwick Warth/Pilning Wetland area. Still, warm sunny and very dry. Four Little Ringed Plover (2 juveniles), 22 Dunlin, 5 Black-tailed Godwits, 40+ Redshank, 2 Common Sandpipers, 40+ Lapwing, 2 Little Egrets and 5 Ravens were seen in the Northwick Warth/Pilning Wetland area this morning. A quick circuit of the Pilning Wetlands footpath produced 4 Little Egrets, 20+ Black-tailed Godwits, 20+ Lapwing, 280+ Black-headed Gulls, 3 Ravens and the first Whinchat of the autumn. A Sparrowhawk was seen on Aust Warth. A morning visit to Northwick Warth/Pilning Wetland produced a flock of 9 Little Egrets, 23 Black-tailed Godwits, 28 Dunlin, 48 Redshank, 5 Little Ringed Plover, 2 Common Sandpipers, a Grey Wagtail, 2 Yellow Wagtails and 5 Ravens. Another 30+°C day. At least 3 Little Ringed Plover, 25 Black-tailed Godwits, 40+ Lapwing, 2 Snipe, 2 Little Egrets, 4 Shelduck broods, 2 Gadwall broods and 2 Ravens were reported from Northwick Warth/Pilning Wetland. No change in the weather. Combined sightings from the New Passage/Northwick Warth/Pilning Wetland area included 19 Black-tailed Godwits, 6 Little Ringed Plover, a Dunlin, 60 Lapwing, 27 Redshank, 2 Little Egrets, 4 Tufted Duck, a brood of 7 Gadwall ducklings, 11 Teal, 2 Lesser Whitethroats, single Cuckoo, Raven and Sparrowhawk. Still hot and sunny. Combined reports from the Northwick Warth/Pilning Wetland area included an adult Mediterranean Gull, an Arctic Tern, 3+ Little Ringed Plover, 11 Dunlin, 2 Common Sandpipers, 30 Redshank, 50+ Lapwing, 5 Little Egrets, 3 Grey Herons and 2 Ravens. Yet another warm and sunny day. The adult Mediterranean Gull, 220+ Black-headed Gulls, 10 Black-tailed Godwits, 14 Redshank, 2 Shelduck broods (17 & 7), 2 Teal and a Raven were seen on a morning visit to Northwick Warth/Pilning Wetland. Two more adult Mediterranean Gulls were seen flying South West over Severn Beach where 3 Little Egrets and 80 Black-headed Gulls were also seen from the shore. A morning visit to Northwick Warth/Pilning Wetland produced 4 Avocets, 3 Black-tailed Godwits, 6+ Little Ringed Plover, 50+ Lapwing, 6 Dunlin, 24 Redshank, 20 Curlew, an adult Mediterranean Gull, 250+ Black-headed Gulls, 5 Teal and two broods of 7 Gadwall ducklings. A sunny and hot day. Reports from Northwick Warth/Pilning Wetland included 3 Little Egrets, 8 Black-tailed Godwits, 4 Little Ringed Plover, 23 Redshank, single Ringed Plover and Common Sandpiper, 3 Dunlin, 6 Teal, an adult Mediterranean Gull, 200+ Black-headed Gulls and 3 Ravens. An adult Mediterranean Gull, 380 Black-headed Gulls, a Common Gull, 2 Common Sandpiper, a Whimbrel and 70 Curlew were reported from Northwick Warth. A cloudy and humid day. Reports from the Northwick Warth/Pilning Wetland area included 7 Little Ringed Plover, 2 Dunlin, single Common Sandpiper, Snipe and Ringed Plover, 33 Redshank, 25 Curlew, 20+ Lapwing, 200+ Black-headed Gulls, 4 Teal and 5 Ravens. A Whimbrel and at least 70 Curlew were reported from Chittening Warth.